The joyfulness, extravagance and humor that Disney regularly brings to the stage was is in full display in Aladdin’s showstopper centerpiece, “You’ve Never Had a Friend Like Me,” as both our hero and the audience are introduced to the hyperkinetic Genie, channeling the late Robin Williams, who voiced the character in the 1992 film. And while no other moment in the play quite matches the Genie’s grand entrance, it’s another solid adaptation of a Disney animated film. 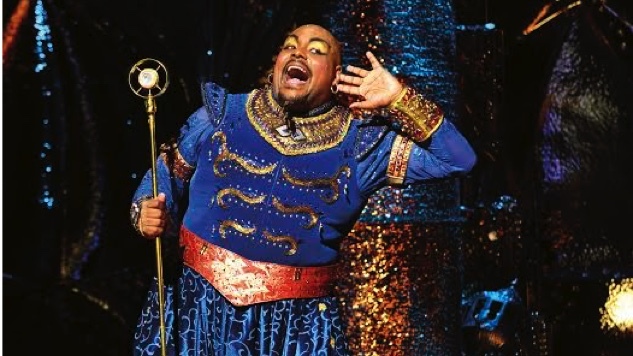 The touring version opened in Atlanta last night at the Fox Theatre with Trevor Dion Nicholas as the Genie. His performance is a rapid-firing assault of modern-day references and clever wit that captures the spirit of Robin Williams along with an imposing physical presence and incredible stamina. It unsurprisingly earned Nichols the 2017 WhatsOnStage Award for Best Supporting Actor when he originated the role on the West End in 2017. Chad Beguelin’s adaptation mostly follows the story of the film with a few notable differences. The animals are gone. Aladdin’s adorable monkey sidekick Abu has been replaced by a trio of companions, just as Princess Jasmines tiger Rajah is replaced by a trio of ladies in waiting and Jafar’s parrot Iago is replaced by a human who parrots him and provides much of the slapstick laughter. And the Arabian characters have been cast without, it seems, much regard to race. Clinton Greenspan stars as the titular street scamp, who falls for Princess Jasmine (Lissa DeGuzman) when the princess disguises herself for a chance to visit the market. They both feel trapped by their very different circumstances. Aladdin is captured by city guards and enlisted in Jafar’s nefarious plan to find a magical lamp and take over the kingdom from Jasmine’s father, the Sultan. Aladdin unleashes the Genie instead, promising to free him with his third wish after winning the heart of Jasmine with his new identity as a prince. Much of the conflict derives from Aladdin struggling to stay true to his roots and to keep his promises. If anything, the plot is simplified from its already straightforward material. The musical includes all the memorable songs of the original from Alan Menken, Howard Ashman and Tim Rice with new songs that include lyrics by Ashman—who died from complications due to AIDS in 1991—which didn’t make it into the movie. And the choreographed battles, street chases and moments of celebration keep the energy turned up throughout the show. Like its Disney predecessors, it’s a great musical for families with dazzling effects (particularly the magic carpet ride) and fourth-wall-breaking silliness. It may not pack the emotional punch of The Lion King, but it’s a fun way to spend an evening.